Learn to play Blackjack better and win more! There are so many ways to gamble and people all over the world do it on a regular basis. The adrenaline rush that the regular casino gambler (someone who goes 4-5 times a week) gets is what drives them. An adrenaline rush is your body activating a heightened state of physical and mental alertness. As long as it’s not sustained for a long period of time, that burst of human energy can be a good thing. 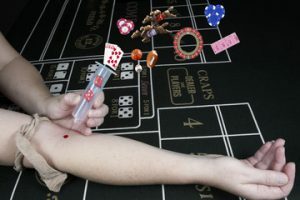 Besides the regular gambler, there are plenty more who enjoy the occasional trip to Vegas or the local casino, or placing a bet on a big major sporting event. Overall, there are definitely more people out there who think gambling is a total waste of money and time. So be it. 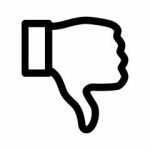 Every single person is allowed to have their own opinion and gambling certainly is not for everybody. I certainly don’t believe in encouraging someone to gamble if they don’t want to gamble. I’m hoping to reach those who are intrigued by the thought of gambling and whether or not they should try it. Perhaps I can enlighten you on the aspects of gambling you weren’t aware of, and by doing so, you can make a more educated foray into it or definitely stay away from it. Of course, it’s impossible to give a concrete answer to whether or not gambling is ok. You’re absolutely going to find people on both sides of the fence about gambling being worth it or not. It’s going to depend on who you ask! I’d just like to provide you with some information to help you determine the answer for yourself. I’ll go over the obvious pros and cons, plus other factors you should consider. Full disclosure though: I absolutely believe gambling is ok! I’m not a professional, but I enjoy the heck out of it! LOL! With the conscious awareness of keeping this article relatively short, I’ve only listed 4 pros, but of course there could be many more. These four are most important in my mind. Without a doubt, the possibility of winning money, no matter the amount, (though more is better) is my number one reason for gambling. It’s possible for anyone, even a complete beginner, to win money. You just need to have some good luck! I am totally entertained by gambling. I probably don’t look very entertained when I’m sitting at a blackjack table, but on the inside, the adrenaline is rushing and I’m excited about the possibility of beating the dealer and winning money! I think it’s a great form of fun. In terms of pure excitement, what other pastimes can compare with the opportunity to win money? I can’t think of any. It is easy to get started with gambling, that’s a good thing. You don’t need much knowledge to play at a casino or place a sports bet. There are a few basic concepts you should understand, but nothing is overly complicated. If you want to be a more serious player, you’ll probably want to learn more, but as a beginner you can easily enjoy gambling with just a little bit of knowledge. Last but not least, let’s consider the various types of gambling available. 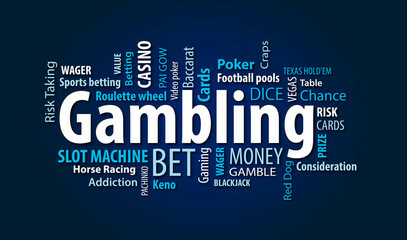 Casino games and sports betting are the most popular forms of gambling, but there are other types, like bingo, scratch tickets, poker and the lottery, to name a few. With so many to choose from, chances are there will be one that you’d enjoy. There are absolute downsides to think about. Let’s honestly take a look at these, in order to make an informed decision about getting involved with gambling in general. The biggest con of gambling is of course the fact that it’s possible to lose money. As a matter of fact, you’re almost guaranteed to lose in the long run with some gambling. The “house edge” of casino games is the best example of this. As mentioned in the “pros” section, luck is needed, allowing you to win frequently, but the overall odds are against you as a player. Over time, you are most likely to end up a loser. Winning on a consistent basis can be difficult. I don’t think anybody can say they’re lucky all of the time, so regularly making money gambling is not a given. If approval by others concerns you, (many people don’t approve of gambling), it could keep you from doing it. My thought is that it’s my money and I’m going to spend it however I like. I can’t let others approval or disapproval of what I am doing concern me. I just don’t mention my penchant for gambling to those close to me whom I feel may disapprove! The last con I’ve listed is probably the biggest reason people disapprove of gambling. It can be highly addicting, and cause major problems and potentially even ruin lives. So I’ve listed what I consider the main pros and cons of gambling, and now you can make your own decision as to whether gambling is okay or not. These are the things I thought about it in deciding whether gambling was okay for me. I can’t tell you either way what’s good for you, but I can point out some facts to help you make that decision. Please carefully consider the pros and cons that were outlined above. Whichever side outweighs the other in your mind, should be your answer. Are you okay with risking losses for the chance of winning? Do you really think you would enjoy gambling? Do you have money you can afford to lose, to spend on gambling? Would your friends and family approve of you gambling? Do you think you could gamble responsibly? 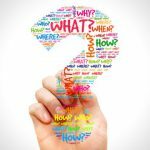 If you answered yes to all of these questions, then I’d say gambling is something you should try for fun. I can answer yes to all of them and as I stated earlier, I totally enjoy gambling. If you answered no to any of them, then, in my opinion, it may not be okay for you. I’m not a professional gambler, but I do go to my local casino on a regular basis and believe that gambling can be an extremely enjoyable pastime if done responsibly. However, I also understand and believe that it isn’t for everyone. I hope my website is filled with information and advice that will help people have the best possible experience gambling. I can only guarantee that you will not win all the time, that’s the nature of the beast! This is one of the more popular variants of blackjack. The reason why is because it’s still possible to gain the edge over the house when you play, if played properly. The reason it’s called Spanish 21 is that a 48-card “Spanish deck” is used. A Spanish deck has the 4 10’s removed, leaving 48 cards. Remember, 10’s are considered player friendly in regular blackjack. Without 10’s in the deck, the house edge raises by almost 2 percent. To compensate for the absence of 10’s, the rules for Spanish 21 are much more liberal than the regular game of blackjack. For example, if you get 21, (hitting to 21 as opposed to being dealt a blackjack) you always win even if the dealer has 21. Within a traditional blackjack game, if you hit to 21, you would “push” if the dealer ends up with 21 as well. Winning hands of 5,6 or 7 cards will pay a bonus. You’re allowed to surrender at anytime, even after hitting, doubling or pair splitting. 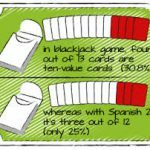 The table below summarizes the typical Spanish 21 playing rules compared to the traditional game of blackjack. 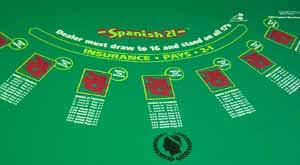 Spanish 21 often pays a bonus for 5, 6, and 7 card hands that total 21, as well as, 6-7-8 and 7-7-7 hands. The payoffs for these bonus hands vary but they are all greater than even money. You can probably understand the thrill in Spanish 21 because of all the different rules and bonus hands that are offered. However, beware, missing those 4 10’s does make a big difference in how the game works out. If you were to play with the same strategies of traditional blackjack, you’d lose your money before your seat was warm! Why? Because the ratio of low cards to high cards in Spanish 21 will obviously be different from that of traditional blackjack. In a 52 card deck, 4 out of 12 cards (30.8 percent) are 10-value. In Spanish 21, it is cut down to 3 out of 12 cards or 25 percent are 10-value. The key point is that these major differences in rules should have a great effect on the playing strategy, meaning it is a bit more complicated. You know the house doesn’t want to make things too easy for you! Here’s a solid example: If you have a stiff 12 – 16 in traditional blackjack and the dealer shows a 2–6, you would stand (except you would hit 12 against dealer’s 2 and 3). With Spanish 21, hitting becomes more inviting because you have less chance of busting because of fewer 10-value cards. Plus, if you hit to 21, you automatically win. Accordingly, some of the traditional “stand on stiffs” becomes “hits” in Spanish 21. When your stiff hand contains 4,5, or 6 cards, traditional strategy tells you to stand (or double) regardless of the number of cards in your hand, in Spanish 21, considering the bonus payouts, the number of cards in your hand can influence how you would play a hand. Yes the strategy is more complicated, but it can be mastered with study and practice. There are several sources available for accurate Spanish 21 strategy. Here’s a couple to checkout: The Big Book of Blackjack by Arnold Snyder and The Pro’s Guide to Spanish 21 and Australian Pontoon by Katrina Walker. For a 6-deck, S17 game, the house edge (as a percentage of initial wager) using the Spanish 21 basic playing strategy (U.S. standard rules) is only 0.37 percent (from Katrina Walker’s book). For a 6-deck, H17 game, the house edge becomes .78 percent. As you can see, the game with S17 is much more player friendly than one with H17; however, to achieve these low house edges, you must learn the Spanish 21 basic playing strategy. The redouble option is available in some land-based casinos. This player-friendly option allows a player to double down again after doubling and getting a card. For example, if you were to double down with a 7-2 and drew a 2 for an 11, you could double down again. 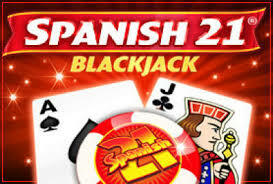 Because Spanish 21 offers the player plenty of options, it provides a sense of excitement not found in traditional blackjack. 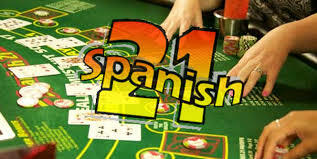 Therefore, more and more players are flocking to Spanish 21 for the thrill of a new challenge. Almost all casinos are offering it now, with tables full of players looking for a more exciting game of blackjack. In this version, both of the dealer’s cards are exposed. To compensate for this, there are rule changes that will favor the dealer. You can assume that the house edge is better than in traditional blackjack, but it still is a top favorite variation for seasoned blackjack players. The strategy for this is absolutely different than that of traditional blackjack. For instance, with double exposure blackjack, you would split two ten value cards whenever the dealer shows 13-16 and of course a hard 19 must be hit if the dealer has a 20. This would not be typical strategy in traditional blackjack. Perhaps the wide variance in edge advantage, is what entices the seasoned blackjack players to take a chance with this version. It can be exciting to know that you have a better than normal chance of winning in certain situations. For example, when you can see that your hand is lower than the dealer’s hand, you know that the only choice you have would be to hit. As alluded to earlier, If both yours and the dealer’s hands are high, say 19 vs. 20, you need to hit. You will still lose if you are dealt a higher card, but at least you won’t have to guess whether to hit or stand. With games like this, who knows, you might still win it. It may be tough to hit an 18 or 19, but if you know (can see) that the dealer has 20, it’s better to hit and try for the small card, than accept immediate defeat! This is another version of blackjack that is more popular online, than offline, but a player’s favorite. Of course it’s easier for the player to make decisions in this because you see the dealer’s hand. However, the rule changes actually give a bigger edge to the dealer, so your strategy must be on point. While the double exposure blackjack odds may not be as good, the game is quite exciting and competitive for many players enjoyment. Played with the correct strategy and skills, a profit can still be made. Good Luck! This was created by card counter Geoff Hall in 2000, and patented in 2009. In this version, the dealer deals out two hands per player rather than one. The player is allowed to exchange or “switch” the top two cards between his hands. A dealers hard 22 pushes all non-busted hands, with the exception of a natural blackjack. There is usually a side bet available called the Super Match. This bet rewards pairs, three-of-a-kind, 2 pairs or four-of-a-kind among both hands. This bet has to be made before the deal takes place. It would seem to be a good bet, considering if you got two top or bottom cards that were identical, it would rob the player of the chance to switch, so at least you could win something. However, this is also considered a sucker bet because, in reality, how often would that happen (not too often) and then of course it ups the house edge. You never want to increase the house edge against you! This is not the version of blackjack you want to play just for fun and relaxation. If you like the challenge of thinking about game play, it’s an excellent choice. Though available at some Vegas casinos, it’s not a popular choices offline, but quite popular online. When played with the proper strategy, the house edge can be reduced to below that of regular blackjack, thereby explaining it’s popularity. The house edge can be reduced to around .10 percent, compared to regular blackjack house edge of .50 percent. Because you have 2 hands in play, you must quickly determine each hands strength and then be able to mentally switch the top cards to determine if you could have even stronger hands. It’s easy to understand that the hardest part of blackjack switch is deciding on the switch. At the simplest level, you want to balance your hands to avoid having a very weak hand against a dealer’s strong hand (when he’s showing a 7 or 8). Against other dealer up cards, you want to make your better hand as strong as possible. There is specific blackjack switch strategy and it is imperative to understand and use it. Because of the fact that the dealer pushes with 22, it forces big time changes to regular blackjack strategy. There is usually more hitting on “stiffs” (a hand of less than 17 that is likely to bust with a drawn card) and slightly less doubling because of the pushing with 22. You can find many different switch strategies available online. Two of the most popular are developed by Arnold Snyder and Cindy Liu. 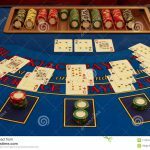 Their charts are too detailed for me to go through in this short post, but I do suggest you look one or both of them up, if you find you have an interest in trying out blackjack switch. What makes blackjack switch enjoyable for many players is that, more often than not, you will win one hand and lose the other, thereby creating a “push,” where you don’t win or lose, but get to play another round! So, you can usually play longer with you initial bankroll. Good luck to you! I’ll first start with a warning that many online casinos do not accept players from the United States because of the many regulations, so look out for that when deciding on an online casino to play at. Considering that you will be playing with your own money, verifying any site’s safety should be your first concern. 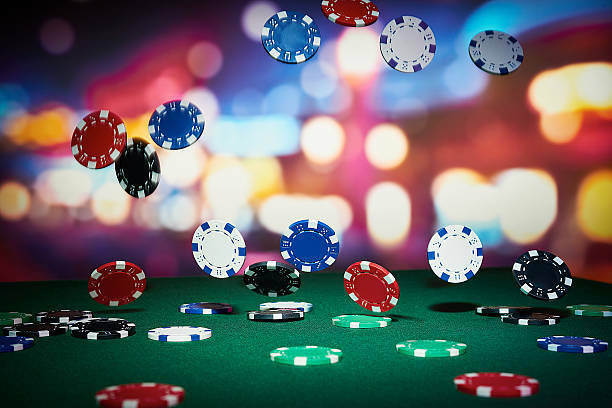 The top online casinos are independently audited and regulated and will support the top notch SSL security encryption, so you know your bank information will be totally safe and secure. Of course you want to be comfortable and assured that your winnings will not be hacked away by some idiot. You want to know that you would be able to collect any winnings. The site may let you make a deposit using one method, like paypal, but in order to withdraw any winnings, another method woud have to be used. That kind of information is usually found within the FAQ section of a website. Make sure you know all the money details before you place your first bet. Check for published lists of bad, as well as, top-rated casinos. A top-rated casino will be certified by a reputable third-party governing body, like the eCOGRA (eCommerce Online Gaming Regulation and Assurnce) or Technical Systems Testing (TST). Once you figure out the site is secure, you want to look at the bonuses the casino offers. 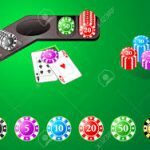 Online bonuses usually come with terms and conditions, including bet requirements to eventually withdraw any winnings, the specific games you must play to use the bonus money and whether a specific amount must be deposited to receive the bonus money. You do want to pick the largest online bonus, keeping in mind the specific terms and conditions. You can find sites online that will rank the top online blackjack sites, offering the biggest bonuses. As with promotions anywhere, “free money” may not really be free, read all the fine print. 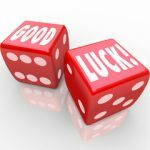 Another key factor to look for in online casinos is that they use Random Number Generators. This is what determines the shuffling and dealing of cards for fair play. The top sites will show that their RNGs are regularly audited and tested as well. 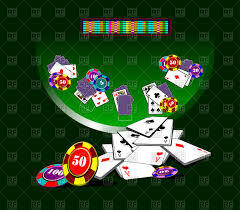 Last but not least, is to determine that the site has a good variety of blackjack games to play. The different varieties let a player make money from a variety of a side bets, keeping the player challenged and interested. Blackjack online provides greater flexibility and unique features not offered at actual casinos. Playing online can be less stressful, with all kinds of practice games and tutorials available for learning. With continuously improved technology, the once perceptable difference between online and actual casino blackjack has decreased significantly to the point where blackjack online is beginning to over take land-based playing. You can’t beat the convenience of being able to play at home. Understanding the basic rules of the game should be your first step in winning at the blackjack table You need to know the correct moves for the different hands to maximize your opportunity for success. 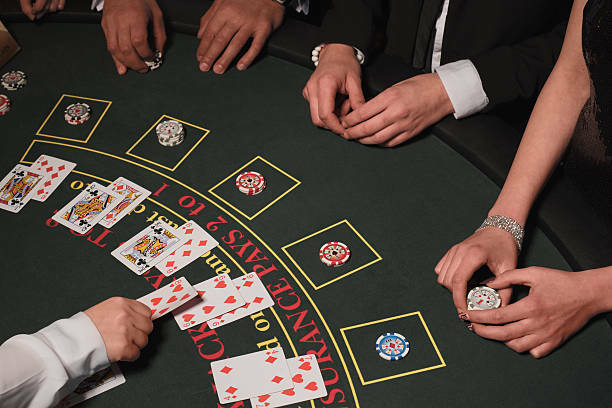 The skill part of blackjack is to avail yourself of the mathematically proven best plays to make when faced with any dealt hand at your blackjack table. When to stand, hit or double down with any hand has been figured out based on the laws of probability, of wins versus losses. Just taking into consideration basic strategy, not using any card counting, there is only one correct play to make in blackjack for any given hand, based on strictly mathematics. Other factors, such as house rules and number of decks used will make a difference in the correct playing strategies as well, which is why you might see several “basic” strategy charts available. Let’s go into a little bit of why that is so. 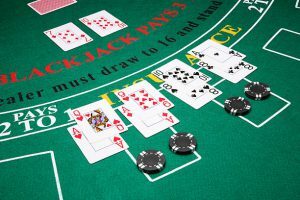 First, as a quick refresher on the basic rules of blackjack, the value of your combined cards must beat the value of the dealers combined cards, without going over 21, for you to win. In a deck of 52 cards there are 16 cards valued at 10 and only 4 cards of each of the other denominations, Ace – 9. So, you are 4 times more likely to pull a ten-count card than any other denomination card. 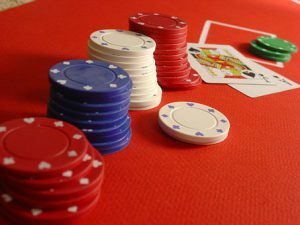 Therefore, when the dealer’s upcard is high (7 or above), he is more likely to be close to 21, with a presumed 10-spot as his “hole” card and therefore hard to beat because he won’t have to hit his hand. Conversely with a low upcard (2-6), he is more likely to have to hit his hand to come close enough to 21 and hopefully, for the player’s sake, bust because of that. Basic strategy tells you that if the dealer’s upcard is a 7 or better and you have a hand totaling 12-16 (aka a “stiff”), you should hit. The reason being that the dealer’s hand indicates strength, so you don’t want to stand with a weak hand. A weak hand is considered anything 16 points or less. This is difficult concept for a novice to believe in. 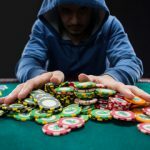 It is probable that by hitting a stiff hand, you would probably bust, but you have to give yourself that better chance of beating the dealer by taking that hit to improve your hand. If you don’t take the hit, you will definitely lose if the dealer is showing strength with a 7 or better upcard. 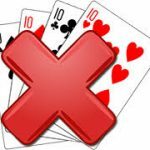 You must make the assumption that the dealer’s hole card is a 10-spot and if you hold with a hand of less than 17, you lose anyway. You have to take the hit to try and improve your hand. Standing on stiff hands, against dealer’s hands showing a 7 or better upcard, loses more often than it wins in the long run, believe that. If the dealer’s upcard is a 2-6, you can assume he has a stiff hand and therefore you want to stand with your own stiff hand. With stiff hands more likely to bust, you want to stand with your stiff hand and let the dealer bust when he has to hit his hand. 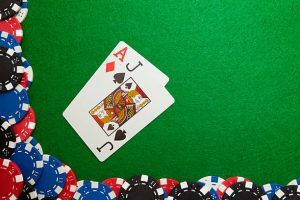 In addition, if the dealer’s upcard shows he may have a stiff hand, it makes it a more opportune time to split pairs or double down, getting more money on the table when the dealer has a great chance of busting. This is the simple theory behind basic blackjack strategy. 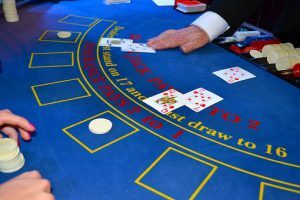 Of course there are expections to these rules, but it does give you a proven winning strategy to use in almost any blackjack game. Surrender 16 versus dealer’s 9,10, or Ace. Remember, basic strategy can be the best weapon at the casino blackjack table, if you simply use it correctly. Ignition Casino – One of the top favorite online casinos because of it’s Real Time Gaming (RTG). 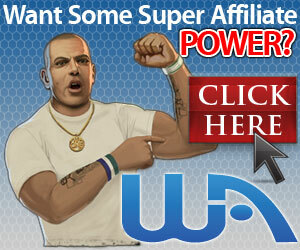 It has very generous bonuses and a superb incentive program that rewards regular depositors. If you’re into Bitcoin, it’s considered one of the best Bitcoin casinos. You can download it for tablets, IPhones,and Androids, as well as desktops for Mac and Windows. Blackjack games available: Classic , Classic Double Deck, Classic Single Deck, European Blackjack, Perfect Pairs and Zappit. Vegas Casino Online – Up to 400% Welcome bonus. Great mobile casino Sister casino of Las Vegas USA casino. Blackjack games available: Classic, Perfect Pairs, European, Face Up, Match Play, Pontoon, Super 21. Bovada – One of the best online casino destinations for US players. They offer at least 6 different real-time blackjack variations for any level player. 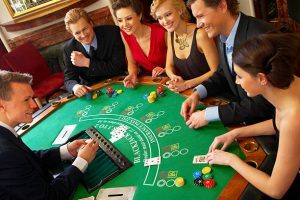 They provide a high level of service with a complete casino entertainment atmosphere with all kinds of gaming available, including live dealer games. 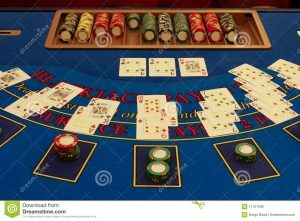 Blackjack Betting Progressions – Is a Negative a Positive? In my previous post, I touched very quickly on negative progression betting. This type of betting is when you increase the size of your bet after a loss. Let’s go over the good and bad of it. One of the most well-known and used negative progression betting systems is The Martingale method. With this system, the amount of your next bet, after a loss, is “double” the previous bet. That is probably the biggest problem with this method. There are other negative progression systems that don’t require doubling your bet size after a loss, but the principal is still the same, increase your bet after a loss. The good thing about it is, that more than likely, you’ll end up ahead or at least at a break even, if you win that next bet after a loss. However, you’re headed for sure disaster with just a few losses in a row. Can Negative Progression Betting Work? Here’s a projected outcome using a negative progression system. I’ll use the same run of ten dealt hands that I used in my previous post on positive progression systems. While this outcome is favorable, it is that way because I have only projected a maximum of 3 losses in a row. What is more likely to happen at a casino is 5 or 6 losses in a row! Think about that using a negative progression system with a minimum bet of $15 and 5 losses in a row. The betting progressions would be: $15, $30, $60, $120, $240, for a total of $465 in just 5 bets. Your sixth bet would have to be $480, and if you finally win with that sixth hand, you’re up $15. Keeping that in mind, your starting bankroll would have to be almost $1000, just in case your session started with 5 losses in a row. Not being a professional, I would never have my starting bankroll that high. Yes, that is an extreme example of what could happen, but it is an easy way to show the negative about the negative progression betting. But that’s why they call it gambling. As stated earlier, doubling up on losses is the basis of the Martingale betting system. Now of course you can modify the system to fit your own gambling style by increasing your bet by a lower percentage (not doubling) and then you can withstand more losses in a row. Unfortunately, you never now how long a losing streak will be. Since the casino will always have a slight advantage, you have to realize that you will probably be losing more hands than you will be winning. That’s the inherent risk in gambling of course. The question to ask yourself is: Can your bankroll handle 5 or 6 losses in a row, if you increase your bet after each loss? How many times are you willing to double up on your bet? What is more likely to happen though, is that you will reach the table maximum in allowed bet size, so you may not be able to make your money back with that next bet, even if the next hand is a winner for you. Remember, the reasoning behind doubling your bet size after a loss, is to win back your lost money with the next hand that will hopefully be a winner. In my experience playing blackjack, it’s not too often that a session of blackjack goes “win a hand, lose a hand, win a hand, lose a hand,” and so on. Blackjack is definitely a game of streaks of wins or losses. Professional blackjack players will tell you that negatve progression betting is risky because it is sort of based on what is known as “The Gamblers Fallacy.” The Gamblers Fallacy is the mistaken belief that, if something happens more frequently than normal during a given period it will happen less frequently in the future. Negative progression bettors wrongfully rely on the belief that there won’t be a lot of losses in a row. I can’t rely on that. I’ve seen too many times, players losing 6 or 7 hands in a row. Now hopefully they would get up after perhaps 5 losses in a row, but they “have a feeling” the cards are due to turn around in their favor and they will win the next hand. As shown in my example above, a nice amount of money can be won, but only if there is not a long streak of losing hands. With a relatively small run of losing hands (5 or 6), a lot of money can be lost very quickly. In my area, the cheapest minimum bet blackjack table is $15, so doubling up on bets can add up to a lot of money very fast. I’m not a professional. I enjoy playing for fun and hopefully making a little side money. In my opinion, there is definitely too much risk and too much money involved with using a negative progression betting system. 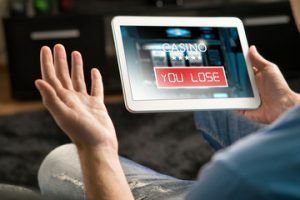 A negative progression betting system can be good, if you’re willing to start with a large bankroll, just in case you run into a bad run of cards. In my mind, a negative is not a positive. I’ll stick with a positive progression system where you can probably play for a little longer, despite a bad run of cards. I believe a negative progression betting system should be left to the true professional player to use because it does involve taking a big risk that you don’t have several losing hands in a row. That’s too big a gamble for me…leave it to the professionals! Having a strategic betting system when playing blackjack is the best way to ensure a winning session. The problem lies in figuring out which one is best for you. There are so many to choose from, keeping in mind the different deviations that can be played, that you should pick the one that’s the easiest for you to learn. For the most part, blackjack betting is done with progressive betting, which is choosing to raise or lower the amount of your bet based on winning or losing the previous hand. Blackjack betting systems are defined as either Positive Progressive Betting or Negative Progressive Betting. With positive progressive betting, you raise your bet after a win. With Negative Progressive betting, you raise your bet after a loss. I personally like and use a simple positive progressive system because I don’t want to use something that is inherently negative! I try to always think positive! This scenario is assuming all winning hands were even money wins, no blackjacks or double downs that pay more. You can see that with just 3 wins or losses in a row, I could still be winning with this relatively conservative positive progessive betting system. I find that I generally don’t have more than 3 winning hands in a row, so my betting rarely goes over $30. Since I don’t do this as a profession, that’s okay. Also keep in mind that if some of the wins were doubled or blackjack wins, I’d be up even more. Many blackjack players swear that progressive betting doesn’t work in the long run, because it does rely on streaks to work effectively. So, my theory behind using a positive progressive strategy is to know when to get up from the table. Sure the pros say it won’t work in the long run, I say, use it in the short run. My strategy is “don’t be greedy.” I live close to a casino, so I keep it a rule that if the cards start to run bad, get up and come back tomorrow! I have my own take on a positive progressive system, as outlined above, and my goal for each session is to win $100, or lose $60, or play for just 1 hour. Once 1 of those three results happens, I leave the table and come back another day. With any betting system you should always have a pre-determined win/loss limit. Just a caution, I’m talking about a POSITIVE PROGRESSIVE system. A negative progressive system is a totally different story to be discussed at another time. As mentioned earlier, with a negative progressive system, you increase (usually double) your bet with every loss. Just imagine how quickly you could lose your money with just a short streak of losing hands. Professional blackjack players will tell you that casino’s like progressive bettors (especially negative progressive bettors) because in the long run, they will lose There again are the magic words “in the long run,” and so your goal should be to play disciplined and not stay at a losing table. A positive progressive bettor can lose money, but will have increased winnings to get ahead and offset the losses. 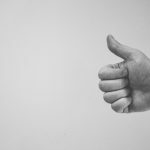 Positive progressive betting is good and can work! This is a top rated book that covers everything from basic strategy to simple card counting, as in most books. It’s another book that will take your game to the next level. This revised edition gives new color strategy charts and advanced strategies on what comes after basic strategy. Many players consider it the new bible of blackjack, that should be in your library of blackjack books. Click the link to purchase the Blackjack Bluebook II from Amazon. Arnold Snyder is a highly regarded blackjack expert in the blackjack community. He has authored several books and because I like his thoughts and ideas on his blackjack forum online website, I figured I’d start my more in depth learning with one of his books. Per the title, I thought it would be a fun read. It does use a martial arts theme and is divided into three parts. It starts with basic blackjack methods and strategies, then teaches a couple of his famous card counting methods. The last part is more advanced than needed because he details working within professional teams of blackjack players. Being one of his first blackjack books, it is geared toward the beginner player, except the last section. It gives basic strategy, some card counting methods ad how to advance into building teams of blackjack players for maximum profit. Some things are outdated at this point (remember it was first published in 1983) and don’t really apply with how the games is played today. I felt that was okay though, because it lets you understand how the game has changed. 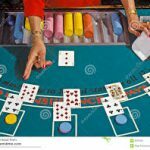 The card counting methods he explains are still used today, but there are definitely easier methods available today. Any level of player can take something away from this book. 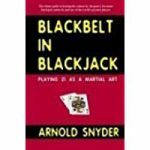 Being a fan of Arnold Snyder’s blackjack expertise, I decide to get this book as well. 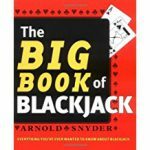 Many readers have stated that this pretty much has all of Snyder’s blackjack knowledge in one place. Considering this came out 23 years after “Blackbelt in Blackjack,” it of course is even more comprehensive and detailed than his earlier masterpiece. Every topic is discussed in complete detail, including the history of blackjack. He actually covers quite a bit of the history of blackjack, more than you might want to really know. If you only want to buy one book about blackjack, this should be it. It has been dubbed “the blackjack bible” by professional blackjack players everywhere. 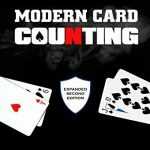 Learning how to count cards is what will take your game to the next level. This book is easy to understand, clear, concise and will improve your game to the point where it will make the game more enjoyable because you’ll be winning more often than not. As a pleasant and helpful bonus, it includes flash cards as visual aids for faster learning. It gives you an in depth analysis of how card counting works and the strategies to use with card counting for a profitable evening of blackjack at the casino. It’s not a waste of money. Strategy Card – Wallet sized, allowed at tables, great reference on what the correct play is in any situation. Don’t have your table mates mad at you because you didn’t play with the correct strategy. Blackjack Verite Games – This is a practice app for Blackjack basic strategy and card counting designed to operate on tablets and smartphones. The app supports more functionality than all other Blackjack apps put together. It includes: Realistic graphics, playing strategies, betting strategies, strategies for unusual games like Spanish 21, Superfun 21, Blackjack Switch and more. Full game customization in terms of 1-6 seat tables, dealer speed variance and more. 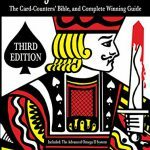 A must for card counters and anyone who wants to practice and understand many of the different blackjack games available. It is worth the money if you want to be a serious blackjack player. Bryce Carlson wrote this book for players to gain the edge at casinos, while mixing in actual stories of what the blackjack environment can be like for the professional gamble. It is a highly recommended book, especially helpful in improving your card counting skills, a vital requirement for profitable blackjack playing. Great reviews on Amazon. Great looking table that comes professionally packaged, so little chance of damage due to shipping. It is a good-weighted table top that will fit comfortably on most medium-sized dining/game tables.